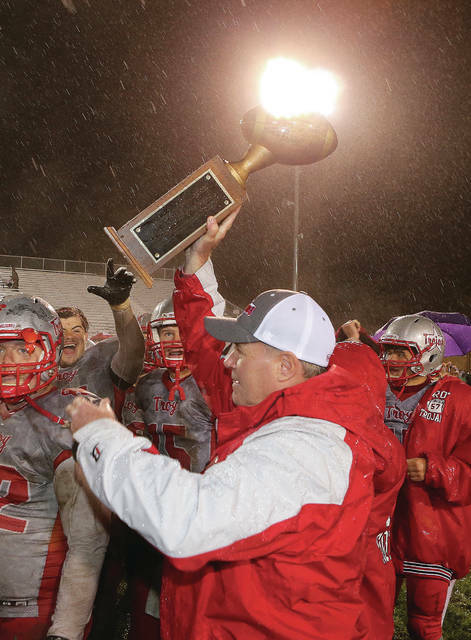 Lee Woolery | Miami Valley Today file photo Troy High School athletic director Dave Palmer awards the Traditions Trophy to the Troy football team after its victory over rival Piqua in 2017. Palmer now will lead the search for a new head football coach after Matt Burgbacher announced he was leaving Troy to coach at Tippecanoe, his alma mater. At least Dave Palmer has been here before. On Feb. 11, 2015, the Troy athletic director began his search for a new football coach, eventually selecting Matt Burgbacher to lead the program. Exactly four years later, Palmer found out he would have to begin the search to find a football coach yet again, as Burgbacher announced he was leaving Troy to accept the head coaching job at Tippecanoe, his alma mater. Palmer said this time he’ll likely follow a process and timeline similar to the ones he followed four years ago when he hired Burgbacher. Palmer said a selection committee was put in place four years ago when Burgbacher was hired. He said the selection committee likely will consist of himself, Troy High School principal Dave Dilbone, a high school staff member, a member of the board office, a member of the Troy Board of Education and at least one member of the community. Four years ago, Palmer said he received in the neighborhood of three dozen applications for the Troy football head coaching job. At the time, Troy had gone 7-23 the previous three seasons. This time, Troy has gone 28-7 the last three years, won three Greater Western Ohio Conference American North Division titles and made three consecutive playoff appearances. He said he hopes Troy’s recent success will create even more interest in the job this time. How long it takes to name a new coach will depend largely on who applies for the job, Palmer said. Four years ago, Burgbacher was selected in late March and formally approved at a Troy Board of Education meeting in April. In the meantime, he said, next year’s football players will continue their offseason workouts with Troy strength and conditioning coach Aaron Gibbons. https://www.tdn-net.com/wp-content/uploads/sites/21/2019/02/web1_palmer_one.jpgLee Woolery | Miami Valley Today file photo Troy High School athletic director Dave Palmer awards the Traditions Trophy to the Troy football team after its victory over rival Piqua in 2017. Palmer now will lead the search for a new head football coach after Matt Burgbacher announced he was leaving Troy to coach at Tippecanoe, his alma mater.